Dr. Elliot T. Udell is a graduate of the New York College of Podiatric Medicine. He completed his residency in Maimonides Medical Center. 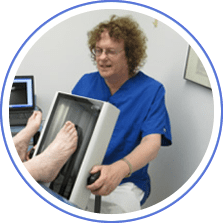 He has extensive experience, knowledge and expertise and has frequently lectured at Podiatry seminars throughout the US, Canada and Europe. Dr. Udell's primary area of interest is in pain management of the foot and ankle where he treats heel pain, neuromas, neuropathy and complex regional pain syndrome when it affects the feet. Other conditions he treats are fractures, hammertoes, fungal nails, ingrown toenails, bunions, running injuries, sports injuries, tendonitis, diabetic foot care, warts, ankle sprains and more. Dr. Udell is on the staff of Northwell Hospital and is the author of a book and many articles on Pain Management of the foot. Dr. Elliot T. Udell is and always has been dedicated to providing patients with the utmost foot and ankle care.